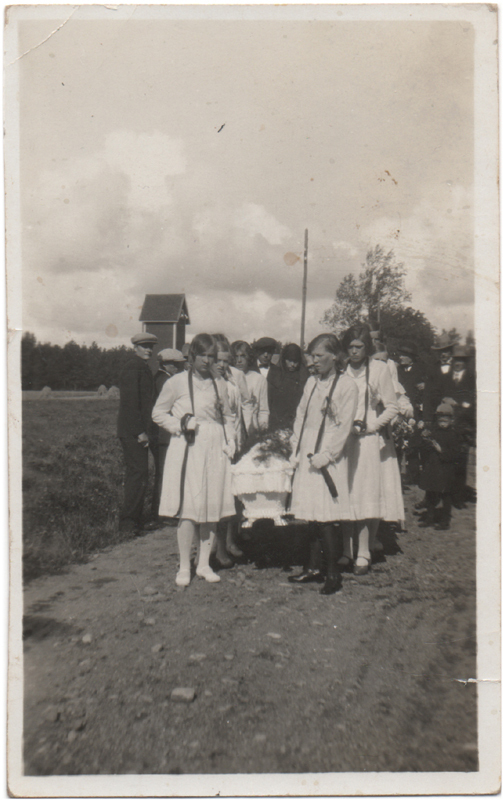 On this picture eight girls, dressed in white, are carrying a white coffin. It appears to have been a beautiful, sunny day during late summer (judging by the stacks of hay in the field). The faces of the young women are stern and grieving – it is clear that the burden is heavy to carry, both physically and emotionally. The rest of the funeral guests are standing behind them, watching. Women are rarely seen as pallbearers. It is customary that this task is performed by the male relatives and close friends of the deceased. Apparently, however, there used to be at least one occasion in the past when it wasn’t unheard of that women would carry the coffin – when the deceased was a young woman, other young women would carry her on her last journey. The photograph has most likely been taken in Finland at some point during the 1930’s. The exact date and location are unknown.